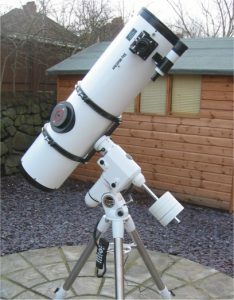 A medium range 120mm aperture / 1000mm focal length refractor that is very good for observing planets, double stars and the Moon. This was my first observing (and imaging) scope which is rarely used for imaging nowadays. 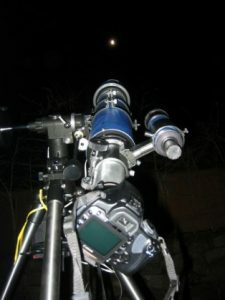 Seen here while imaging the total lunar eclipse in 2007, the DSLR camera fits on to the end of the Skywatcher 120 telescope (with stock lens taken off the camera and eyepiece taken off the telescope) using a canon t-ring adaptor. 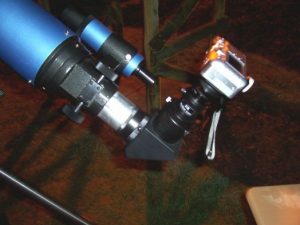 Used in the early days to image the Moon, the Canon S30 was attached to the Evostar 120 with a specialised bracket to hold the camera lens up close to an eyepiece. This is called the ‘eyepiece projection’ method. 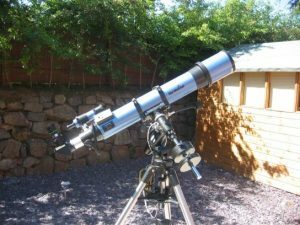 Used in this format (dobsonian) for observing only, the Skyliner 250px is a powerful 10″ reflector which excels at showing off the Moon, planets, globular clusters and the brighter galaxies. 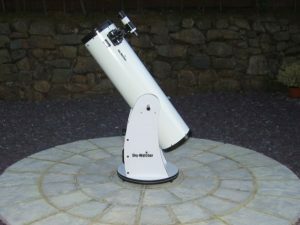 The dobsonian format without the mount makes it easier to “set up and go” for an observing session. It has a focal length of 1500mm. The 250px is also my primary imaging scope for galaxies and nebulae (with the exception of large nebulae which will not fit in the frame due to the high magnification). The EQ6 mount which the 250px is mounted on is now used for all telescopes when imaging.